Uglyworld #443 - Jigsaw Bear Puzzle Thingy (100-365), originally uploaded by www.bazpics.com. This morning when I got up for work at 5am (yes I am crazy) I was amazed to hear some noise coming from downstairs in the living room. After getting showered and ready I ventured down to see what the source of the noise was, and discovered Jeero standing with a confused look on his face beside pieces of a bear that I ordered last week. As soon as he realised I was walking down the stairs he said, "Oh baz, this comes in the mail yesterday just likes this, I tries to fix it, honests". 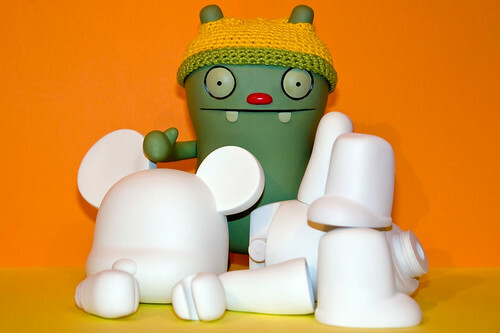 I know that the bear would ship all in one piece and that Jeero will have been the reason for it now being split apart but I was too tired to give Jeero into trouble, so instead I told him that as long as he was really careful not to break any pieces he could continue trying to put it together. Jeero's final remark as I was going out the door was, "wow, this is likes my very owns jigsaw bear puzzle thingy".